Well, things have gone pretty crazy since my 30th last week. You all know I got engaged – so we’re hunting for venues to make sure we can book one up for next summer. Meanwhile, the purchase of our first house is going through! Anyone who’s bought a house in the UK (and/or probably everywhere else!) knows how stressful that is and how much paperwork is involved. And then paperwork for your paperwork. Both of these things happened kind of suddenly (long story about how buying a house can happen suddenly! ), so there was no time for planning or preparation and my mind is currently running between furniture and contracts on a hectic loop and not a lot of blog content is coming out of it right now! I’m also not commenting as much on other blogs – I am still reading though when I get chance. Fortunately, I’m a hoarder and have some photos in the archive, including this set. The photography isn’t top notch as these particular ones probably pre-date my newer lens (and my 30s! ), but I still kinda like them for their hazy quality. 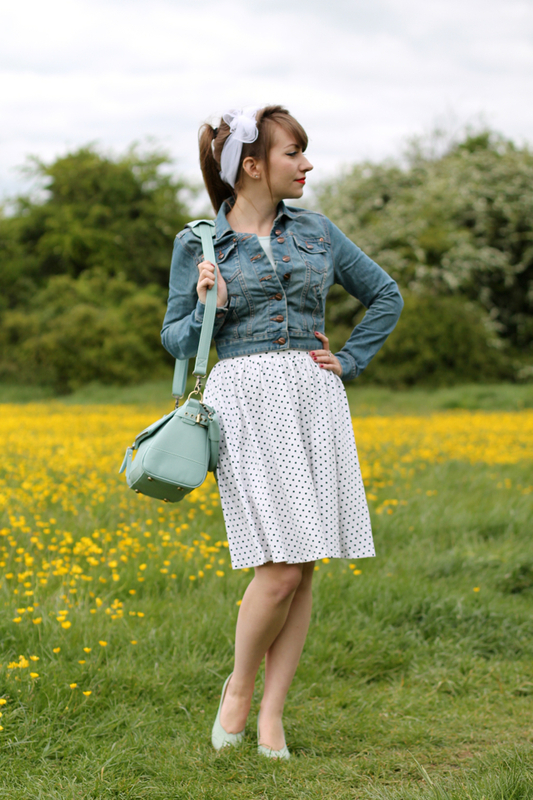 This outfit was also created with lots of bits I already had in my wardrobe and features the denim jacket I wear constantly in spring, but hardly features on this blog. It was about time it showed up here! I really like wearing it buttoned up with my full skirts, because it’s just the right length that it doesn’t squash them down. 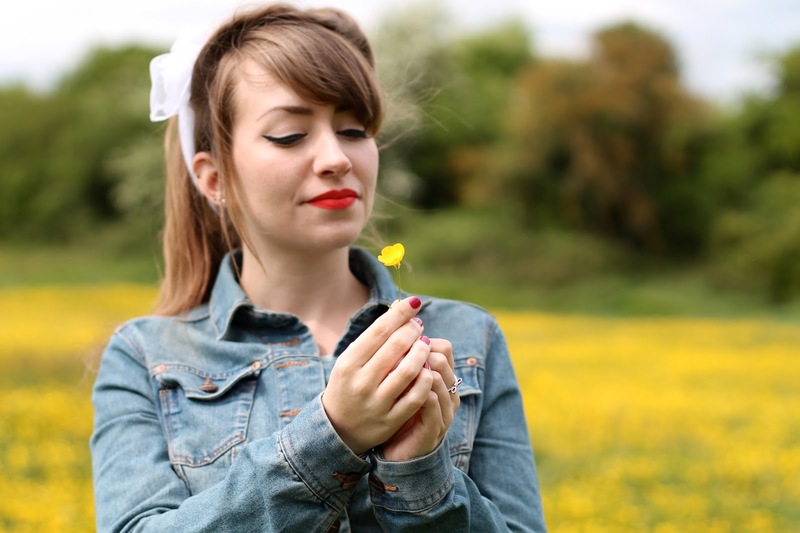 These shots were taken on a typical breezy, overcast spring day here in the UK in a field full of buttercups. There’s something classically British and lovely about that, even for a wind-hater like me. 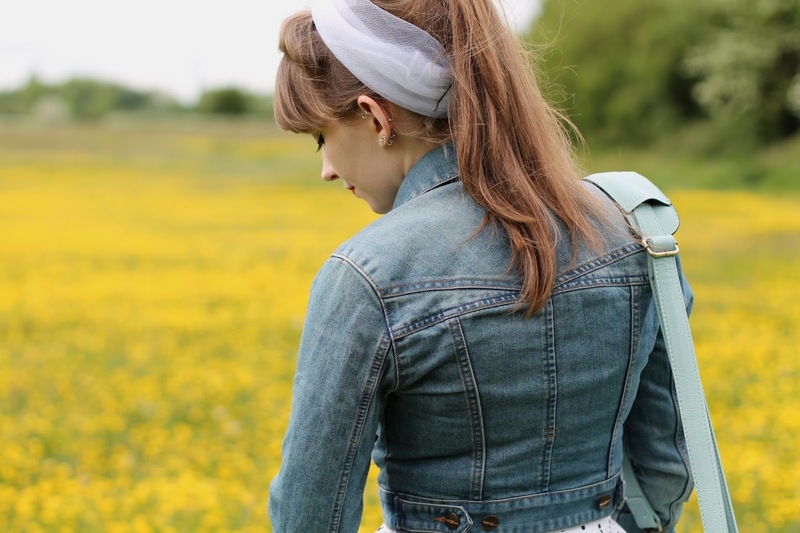 This is such a cute, fabulously fun outfit – and reminder to us all to rock our classic jean jackets in a vintage inspired context far more often. Goodness knows I'm guilty of letting mine gather dust in the closet (figuratively speaking!) far too often. I hope you're having a beautiful weekend and are basking in the unmatched joy of being engaged! 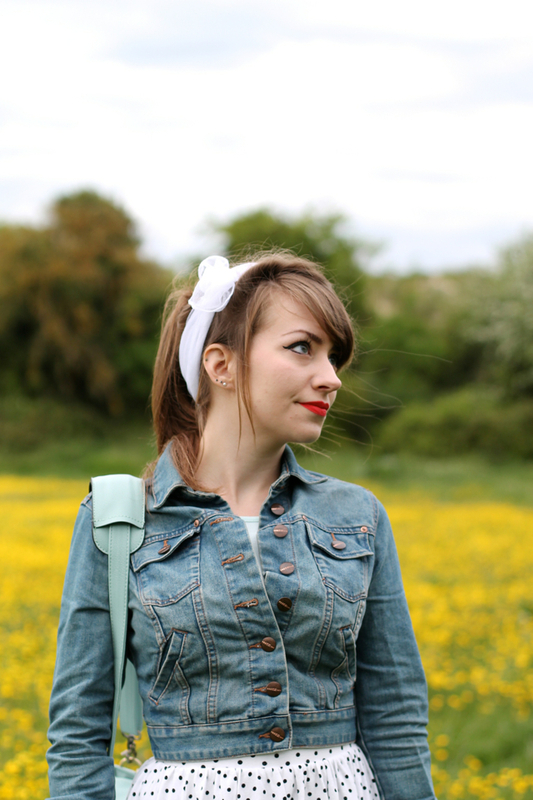 I love a good denim jacket! When you find one that fits you well, they're so handy to have around. Lovely look and all those buttercups make a great background. Congratulations on your engagement! Good luck with the venue search and the house buying. Good luck with the house hunting. There's something incredibly reassuring about having your own home, I find. It will all be worth all the stress. Definitely, I absolutely can't wait! We've just picked up the first piece of furniture (a dining table set) specifically for the new home and suddenly it's starting to feel a lot more real! Love the outfit. 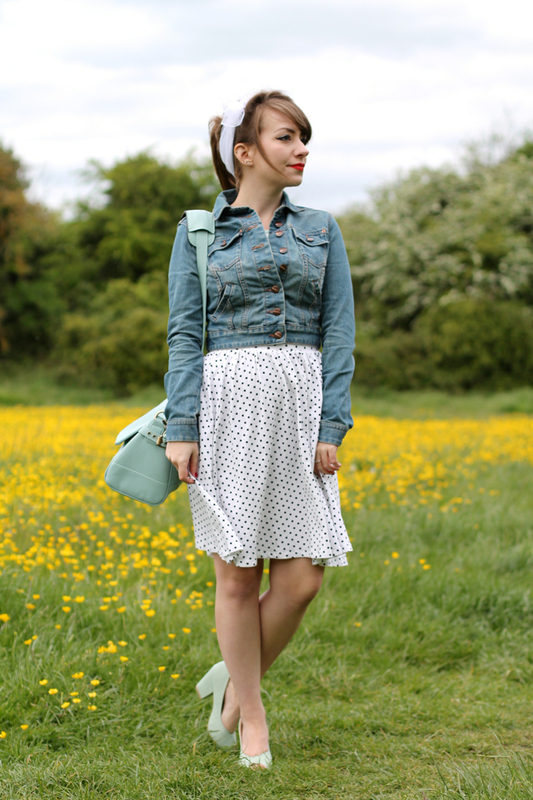 The perfect denim jacket really is a must have in spring, and I think you've found just the right one. Sometimes they're either too long or too cropped, so one that hits right at the waist can be hard to find. Good luck with the house hunting and wedding venue hunting! So many exciting things happening! <3 Love these photos too! So cute!